Support 1: We all Sick from time to time. Thesis: As you can conclude from the above, a hospital is a great growth dover for any town. My hometown has many great and commendable people, and places. I’ve grown up in the area and I think that I have grown to be a fairly well adjusted person in my community and beyond. However, it seems as if my hometown is one piece of craft that was completed, never to be improved. Nonetheless, if I were to be just one thing to change, I would for a very good hospital and here are my reasons. We all get sick from time to tune, which means that we must seek medical attention. As such, having a very good hospital in my town would greatly help my town to grow from what it is. A hospital is the one thing that fuels growth. This partly because the nearby towns don’t have good hospitals so if my town has a good hospital, people from nearby towns and beyond would want to come there for treatment. With a completed hospital, that has a reputation; it will mean that more patients will want to come for treatment. This will mean that other businesses in the area will thrive since patients will often need accommodation, food, and various items from the shopping center. Ultimately, this will have a ripple effect of growing the town in order to cater for the growing demand. spital staff will need food, accommodation, and other essential Items to live comfortably in the area, which means more growth for the area. 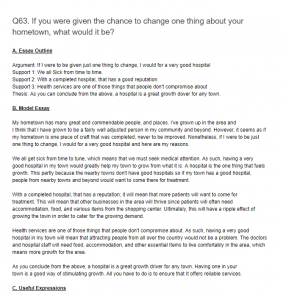 As you conclude from the above, a hospital is a great growth driver for any town. Having one in your town is a good way of stimulating growth. All you have to do is to ensure that It offers reliable services.